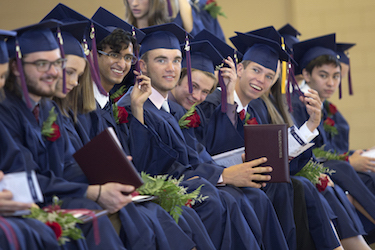 A busy summer at Prairie began with the Class of 2016’s commencement in June. As a group they earned a record $10.5 million in merit-based college scholarships, maintained our average ACT score of 27.1 and enrolled in 45 colleges from coast to coast, including some of the most selective and highly ranked in the country – MIT, Vanderbilt, Wake Forest, The Universities of Wisconsin and Minnesota, Carleton College and Colorado College are among those our alumni will be attending. Summer continued with girls’ soccer winning the WIAA Division 4 State Championship – a first for a girls’ team from Racine County – and our school earning the Lighthouse trophy for the best all-around athletic program in the county. In July and August, the school was a hive of activity with dozens of summer programs taking place, including our nationally recognized Center for Developing Excellence STEM Academy. Prairie’s faculty has also been busy: taking classes, getting masters degrees, attending conferences, traveling to areas they teach about, reading, developing new skills, teaching summer programs and gearing up for another great year. In the coming weeks, we look forward to sharing some of their professional growth projects, as well as biographies for all our new faculty members. Our Facilities team has also been working tirelessly to prepare for another year – over 250 energy saving LED light bulbs have been installed, the greenhouse has been rebuilt to support the edible classroom program, and we replaced the vast majority of our HVAC controls with new systems that will significantly reduce our energy use and cost of operating. In the world beyond Prairie, summer has seen us experience a roller coaster of emotions with multiple terrorist attacks, the passions of national political conventions, and the joyful solidarity of the Olympics. At times, the horrors of violence can overwhelm us and we are unclear what to say or do for our children. Here are a few ideas and resources for supporting your child in stressful times. Additionally, keep in mind that it is important to spend fun and joyful times with your kids, always keeping lines of dialogue open, while making time to discuss important non-violent issues and events as a families. This year we will be working on enhancing Prairie’s sense of community, shared purpose and civil civic discourse. Tip O’Neill, long time Speaker of the House, coined the phrase “all politics is local,” but in today’s 24-hour news cycle many have become focused solely on the national debate. However, our day–to-day lives are profoundly shaped by local leaders: mayors, town councils, school boards, county boards, state senators and representatives, county executives and all of the many other elected local leaders. It is important that our students become familiar with our local issues and leaders. I hope you will join us in our efforts to engage our students in the local political process this year. We will also continue to grow our students’ listening and critical analysis skills so that they can understand multiple points of view, engage in courteous dialogue and support their beliefs with accurate information while respecting other points of view. F. Scott Fitzgerald once said, “the test of a first-rate intelligence is the ability to hold two opposed ideas in mind at the same time and still retain the ability to function”, and it is important our students be able to see the many sides and nuances of complicated subjects. Further, it is also important students appreciate the importance of close relationships with teachers and peers. Working closely within a diverse community of learners prepares our students to thrive in college and beyond. Prairie families are committed to creating the next generation of leaders through a well-rounded renaissance education where every student is known and valued while being supported and challenged as scholars, artists, athletes and leaders. Our shared goal of every child growing to be his or her best self is enhanced when all of the adults in their lives are engaged as members of the school community. This fall we have a number of community events on the calendar: the Primary School ice cream social, Middle and Upper School parent nights, Primary School dinner and dialogues, division-specific off campus socials and Fall Fest are all great opportunities for fellowship and community building, and I look forward to seeing all of you at some point. I hope you and your children are as excited as we are for the start of Prairie’s 52nd year. As we go through the school year make sure to call or stop for a visit if you have any questions or concerns. The faculty and I are eager to work with you to help your children become their best selves.